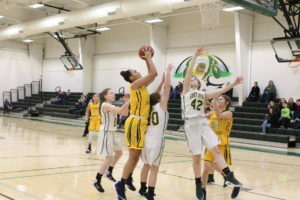 The Lady Cougars were in stride with Petersburg in the first half, but the Lady Vikings pressure was too much to handle causing a hasty retreat on senior night as Petersburg commandeered a 74-51 victory in Baker on Thursday. East Hardy Girls Basketball recognized seniors Emma Baker, Leanna Basye, Julia Hahn, Brooke Miller and Lexi Strawderman before the contest in addition to the senior cheerleaders. “It seems like for us every four years we send a group out of here. It’s hard to always see them go, but you hope somebody steps in and fills their shoes next year. They worked hard for us and did a nice job these seniors. Those two girls [Brooke Miller and Julia Hahn] came a long way from the first time they stepped on the floor as freshmen and they’ve carried our team through a lot of games. They deserve their 1,000 points,” East Hardy Coach Bridget Billmeyer remarked. 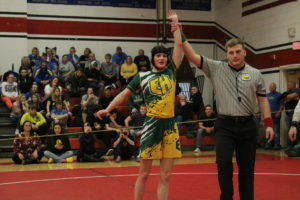 East Hardy won the first meeting against the Lady Vikings at the beginning of the season, but Petersburg’s dynamic changed with improved confidence over the course of the year and this time around the Lady Cougars were without senior guard Lexi Strawderman due to illness. “I think our depth and pressure wore on them throughout the game. They are strong inside, but our pressure made it difficult to get the ball inside. I thought we played with more effort in the second half as well,” Petersburg Coach Jon Webster commented. East Hardy senior Julia Hahn scored a game-high 22 points in the loss, followed by fellow senior Brooke Miller with 16 points. Petersburg was led by Hayley Ours with 16 points, followed by Burgundy Roby with 14 points and Casey Watts with 11 points. 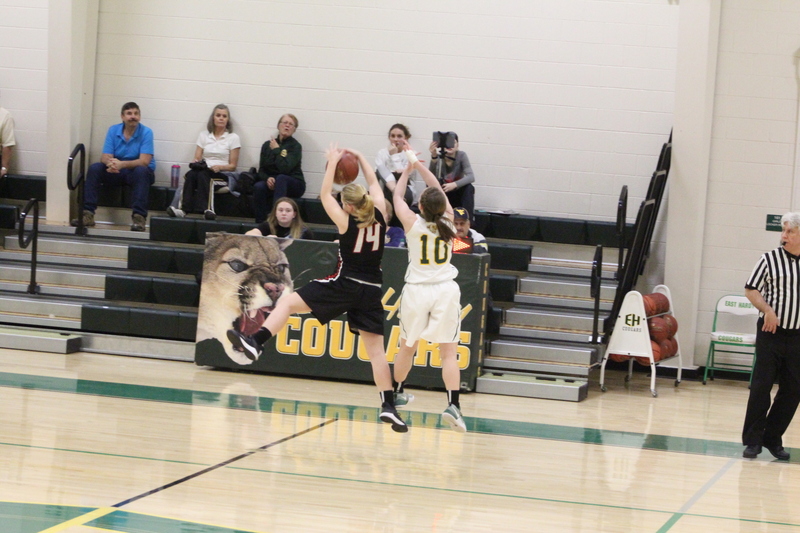 Nine seconds into the game, Brooke Miller drew a foul and knocked down one free throw to give the Lady Cougars the initial lead. Petersburg’s Burgundy Roby made an offensive rebound and had her shot blocked and stolen by Miller, then Emma Baker passed to Hannah Fogel for an East Hardy jumper. The Lady Vikings finally got on the scoreboard at the 7:04 mark with a jumper from Casey Watts, 3-2. Petersburg applied full-court pressure and did this a majority of the game as Hayley Ours stole the ball and missed with Miller pulling down the rebound. Fogel passed inside the paint to Julia Hahn for a basket at 6:15, extending the lead 5-2. On the next possession, Burgundy Roby made a short range shot for the Lady Vikings. Leanna Basye collected a rebound and made a baseline save, but the ball was intercepted by Ours, then Petersburg missed two attempts with rebounds going to Ours and Hahn. 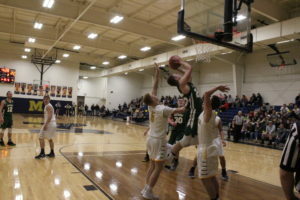 East Hardy hit the iron and there was a scramble for the loose ball with Roby finding it and receiving a foul before making one free throw to tie the game at 5-all with 5:04 left in the first period.